Redmi Note 5 Pro is one of the best Budget devices with excellent hardware but with a Mediocre OS. The MIUI isn’t that great when it comes to Android Updates. There are many best Custom ROMs for Redmi Note 5 Pro which bring the latest Android OS, features, and Performance. Custom ROMs are the easiest way to modify your Android Device. These ROMs comes with great features which are missing in MIUI or any other Android Skin out there. The best part is that they are free of Bloat and you can use Android to its full compatibility. 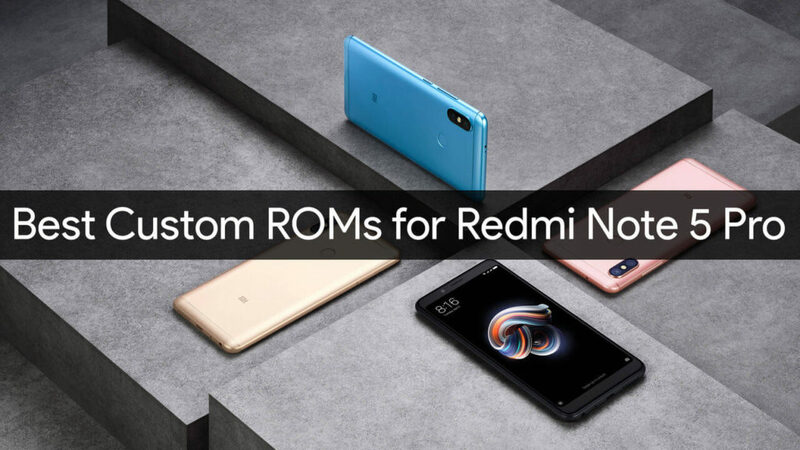 We selected these Best custom ROMs for Redmi Note 5 Pro by looking at there features, Performance, Stability and Updates frequency. You need Custom Recovery flashed in your Device, Check out the FAQs section to flash recovery and Download GApps. That’s it! Recovery is flashed. Boot into Recovery and Go to Wipe section. Wipe Data, System, Cache and ART cache. I soft bricked my Redmi Note 5 Pro, What to do now? Sometimes, due to some mistakes, the device can go into a Bricked condition which means it does not boot into the OS. The device just stops at MI logo. Boot into recovery, perform a Full wipe and Re-Install the ROM. How to revert back to MIUI firmware? Stock ROM VS Custom ROM: Which One is better for you? Love Redmi Note 5 Pro , but only with stock rom .